How to show Effective Marketing Leadership? What does it take to be an effective marketing executive? This is a quote from Robert Rose. You can find the quote on many blogs on the Internet. It’s quoted this often because many marketers recognize the situation. Somehow they end up in a spin of trying to solve problems all day, and deliver on the internal demands. They are hard working, and provide a lot of output. 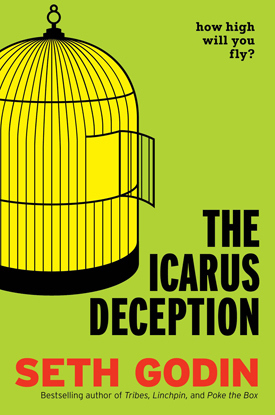 If you’ve read Seth Godin’s recent book, the Icarus Deception, you know about the Lizard Brain. It’s your brain constantly pushing you to take the easy route. To stop working as soon as stuff gets difficult. To only take on the pleasant, easy, or fun to do- work. So often this pleasant type of work is unimportant. But we keep on pushing these important tasks ahead of us. They escape to the “not important” activities. And managing their lives by crisis live. Because they are not urgent, they don’t do them. In the current economy, many marketers take the shortest route to success. No wonder so many of us keep poring money into advertising. We need revenue, quick! OK, let’s do a communication campaign. We need revenue, quick! OK, let’s do a lead generation campaign. We need revenue, quick! OK, let’s do a mailing. If you have not done the groundwork to understand customers, you are not creating meaningful marketing for your customers. And the results are below expectations. And because the results are below expectations, you need to do more short-term focus activities. Let me break the ice for you: You are an irresponsible marketer. This is why CEO’s do not trust marketers anymore. 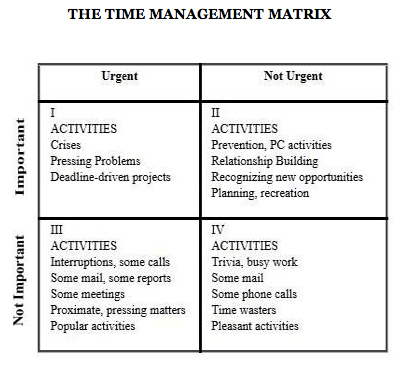 The time management matrix by Stephen R. Covey. What does it take to run your marketing effectively? How do you find the time to do the really important work? How do you fight your lizard brain? Focus on the things that are not urgent, but are important. You are smart enough to know what’s important in your organization. In “7 habits of Highly Effective People“ from Stephen R. Covey, Stephen describes, on a personal level, exactly what you should do, to focus on what’s important. He asks ” What one thing could you do, if you did on a regular basis, would make a tremendous impact in your life?”. What one thing would make a big impact on the business? Stephen Covey’s message applies also to effective marketing organizations. 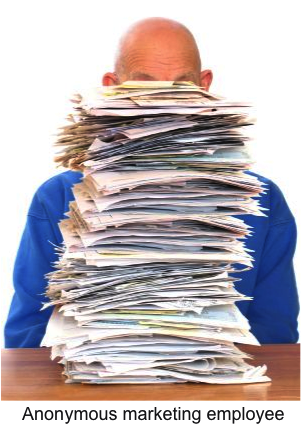 The key to an effective marketing organization is understanding that you need to focus on non-urgent, but very important things to do. Write your personal mission statement. I myself use a principle called 6 boxes. I think it originates from a method developed by Peter Bregman, found in his book ’18 minutes‘. It’s a pretty simple excel sheet where I write down 5 key things I want to achieve. Each time something needs to be done, I give it a place in one of these ‘boxes’. If it does not fit in any of the 5 boxes, I’ll put it in a 6th box called ‘The other 5%’, which basically means: I’ll get to it when I have the time. Long-range planning. Plan time to actually do the stuff, which is in the 5 boxes. There are no more excuses. Do what you said you would do. And actually do it. Foresee problems, be proactive. There will always be priority jobs that move you away from doing the stuff which is in your 5 boxes. That’s why you need to train yourself to be proactive. To foresee problems. And fix ‘em before they happen. Start saying no. It’s almost impossible to say “no” to the easy stuff. 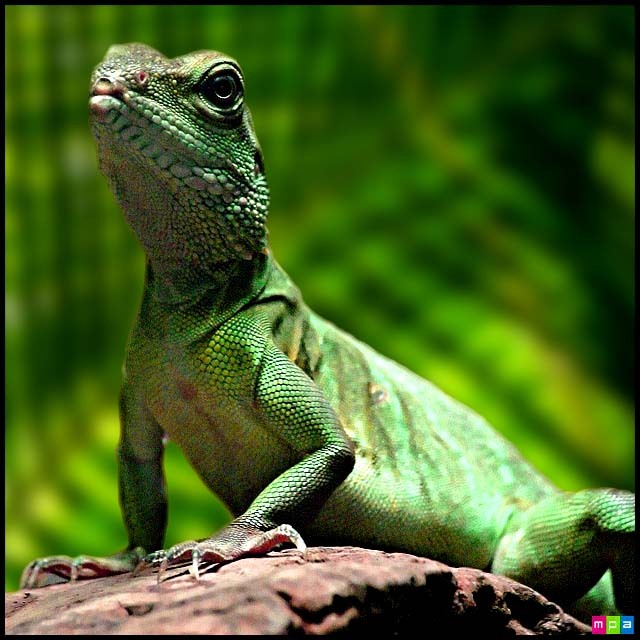 Your lizard brain is playing with you. You need to have a bigger “yes” burning inside of you. Your priorities make you say yes. All the rest is no. Decide on what your priorities are, communicate them, and start saying no. Get yourself organized to do what’s important. Start making a tremendous impact on the business.